Are visitors to your travel agency marketing website leaving without a trace? Are you struggling to figure out how to turn your visitors into leads? In this case study, we’ll learn how Anywhere® recovered 56% of abandoning visitors to their site using a simple travel agency marketing tool. Anywhere® is a modern travel agency merging real traveler insights with the ease of online booking. Their team of experts design authentic, personalized vacations one trip at a time to exciting destinations. Anywhere® currently focuses on seven destinations. Each destination has its own microsite within the website that provides information like maps, lodging, transportation, and more. The primary call to action at each microsite is to plan a trip using their free Travel Planning Service. It’s a four-step process where readers share preferences about their upcoming travels. Anywhere® then uses those details to provide a sample itinerary. Sample itineraries are a powerful travel agency marketing tool because they help take the lofty idea of an adventure and turn it into concrete details. Visitors who complete the Travel Plan and receive their itinerary are more likely to eventually book a trip with Anywhere®. For that reason, Anywhere® decided to use OptinMonster to encourage every visitor to complete the survey. These optins convert between 1.5% and 3.9% of abandoning visitors, depending on the country destination. They are triggered using our patented Exit-Intent® technology. When a visitor motions towards the browser bar (a clear signal they’re about to leave the site), the optin appears. Each optin also uses our Yes/No feature to redirect the abandoning visitor to the travel planning service. Our Yes/No feature allows you to display one or two buttons instead of a signup form. The buttons can either launch a traditional optin form, redirect the visitor to a new URL, or simply close the optin. 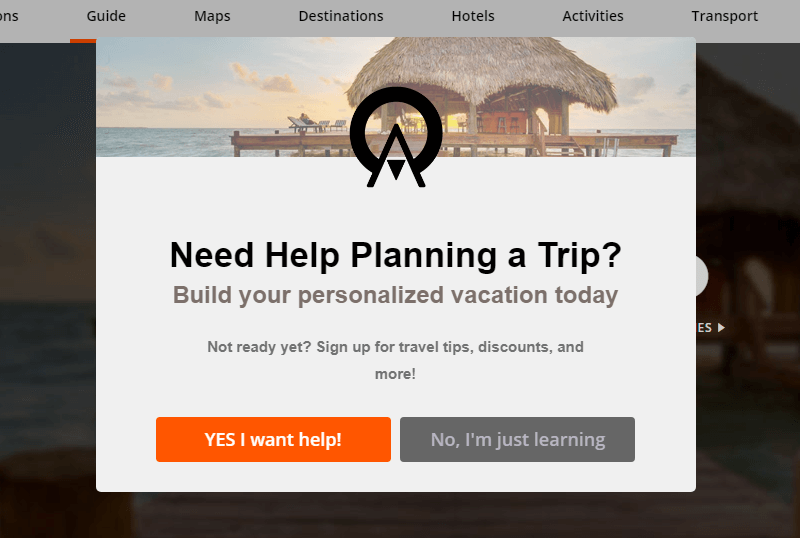 Anywhere® uses the Yes button to direct readers to the travel planning service and the No button to redirect visitors to the homepage. It’s important to note that their choices assume the visitor wants to stay on the site. Whether the visitor chooses Yes or No, Anywhere® still keeps them from leaving the site altogether. This important marketing strategy instantly increased the average pages per session. Once a visitor clicks yes, they are directed to the four-step travel planning service. 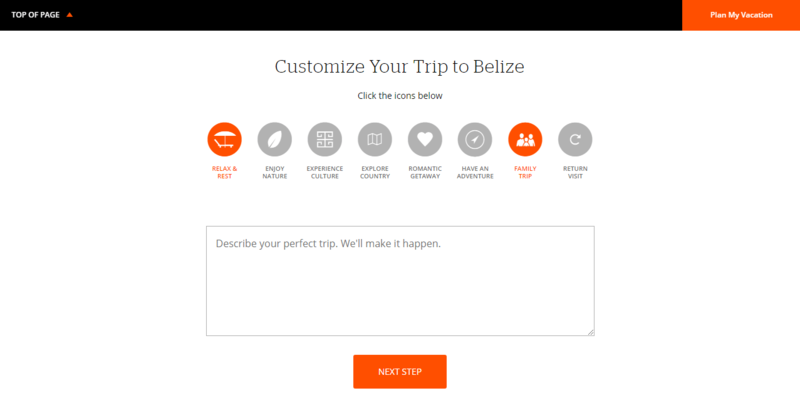 On step four, they are instructed to provide their email address to receive the completed itinerary. If they attempt to leave without completing the form, another exit-intent popup appears. These optins convert between 30% and 56.24% of abandoning visitors. They serve to remind visitors of all the work they’ve put in up to this point, and encourages them to finish planning their trip. Once Anywhere® has the visitor’s email address, they can continue to to market to them with travel industry email marketing campaigns. Targeting your marketing campaigns to a user’s behaviors is called behavioral automation. When behavioral automation is done on your own website, it’s called onsite behavioral automation, or onsite retargeting. Learn more about how to use onsite behavioral automation to increase conversions. Creative travel agency marketing campaigns mean nothing if they don’t produce results. It was important to Anywhere® to be able to measure how well these optins were working. How many visitors started to leave the site, but were redirected to the Travel Planning Site from the first campaign? Of those redirected visitors, how many started to abandon their travel plan, but were recovered by the second campaign? How many visitors who clicked EITHER campaign completed every step and got a sample itinerary? To do this, they added a little bit of code called UTM parameters to the redirect links used in their OptinMonster campaigns. UTM parameters, also known as UTM links, are little snippets of text added to the end of your URL to help you better track your marketing campaigns. For example, the first optin redirects the visitor to the travel planning tool, specific to the country they’re interested in. The second optin has a unique UTM link, too. The only difference between them is that the utm_campaign references the individual optin, in this case AAA-step5-continue. The NO buttons for each optin have similar UTM links, too. Each individual piece of this UTM link can be tracked in Google Analytics. Using these links, Anywhere® can see how visitors progressed from one optin to the next, and eventually to the thank you page shown after someone completes the travel plan. Learn more about using UTM links for marketing campaign tracking in Google Analytics. Once we started using OptinMonster and tracking the referrals to the first step of our Free Travel Planning Service page via pop-up, we found it to be 441% more effective than our overall campaigns’ average conversion rate for that specific goal. Anywhere® saw their email list grow at a steady 20% growth rate each week (approximately 100 new subscribers a week) using OptinMonster. Travel agency marketing has never been easier using OptinMonster. 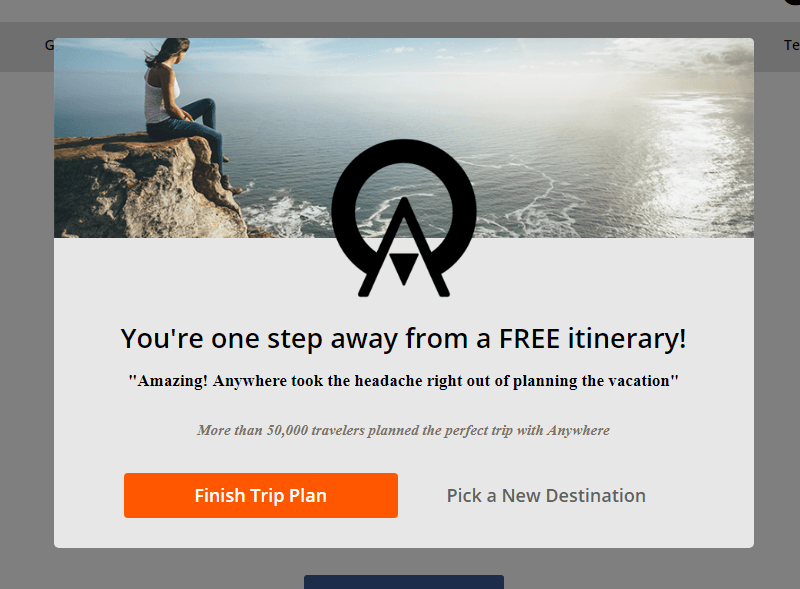 Anywhere® used our exit-intent optins to push visitors towards completing a free travel planning survey and saw huge increase in the list as a result. Anywhere® grew their email list by 20%. Anywhere® recovered 56.24% of abandoning visitors. Anywhere®’s OptinMonster campaigns were 441% more effective than similar marketing efforts not using OptinMonster. Don’t let your potential customers leave without trying to get them to stay. Identify the areas of your funnel where customers are most likely to leave, and target those pages with an exit-intent optin. You worked hard to get them; work equally as hard to keep them. OptinMonster allows us to capture low hanging fruits from our already strong organic traffic very effectively. The YES/NO form also allows us to direct casual browsers into actionable pages that converts them into sales-qualified leads. Especially with a complex website structure as ours, the pop-ups serve as perfect breadcrumb prompts that leads customers to their next step. Our email list grew at a steady 20% growth rate each week (approximately 100 new subscribers a week) using OptinMonster.